A pair of Beautiful Genuine Antique. 925 Stirling Silver Threepence's. but set into thick purpose made cup rings made especially for silver threepence's. We only use Genuine. 925 Silver Threepence's. 925 STERLING SILVER Gothic skull cufflinks. The size of skull is approx 16 mm by 12 mm. They are made of 925 sterling silver and stamped 925 silver mark. Sterling Silver Football Ball cufflinks. Dispatched with Royal Mail 2nd Class Large Letter. Full UK hallmark. 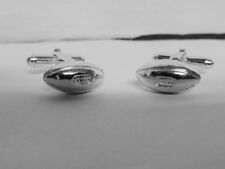 925 STERLING SILVER oval shaped plain cuff links. They are made of 925 sterling silver and stamped 925 silver mark. It is suitable to get engraved, personalized. Weight: 5.31g approx. Size: 22mm 14mm. ENGLISH ROSE Hallmarked Silver Cufflinks. These exclusive ENGLISH ROSE cufflinks are a classic design. Bold and striking in the Tudor rose style they are a great novelty cufflink. A symbol full of historical import that continues to identity as uniquely English. You are bidding on a set of Solid Silver Cufflinks Celtic Design And Tie Pin 925 20mm 9.2 Grams Rare. Condition is Preowned but never used . A lovely set See all the pictures. No reserve so happy bidding. Napkin Rings & Hooks. Real 925 Sterling Silver & Abalone Oval Cufflinks Gents Formal Suit Work Wedding. Sterling Silver & Turquoise Oval Double-Sided Cufflinks Double Sided Cufflinks. Smaller Knot 8mm x 8mm x 7mm. 925 STERLING SILVER round shaped Celtic design chain & T bar cufflinks. They are made of 925 sterling silver and stamped 925 silver mark. Weight: 7.57g approx. Size: 16mm 16mm. Dunhill Sterling Silver Cufflinks, has faceted mother of pearl insert, hallmarked, toggle marked steel, although preowned in lovely condition, sold with shown non original box. They are very slightly different in shape and the middle Silver link in each one is different so I'm not sure if these two started life as a pair but whatever the case they still make a good matching pair. Dunhill Heavy Sterling Silver Cufflinks, hallmarked, preowned but in good condition, has light marks on face, but these would polish out if deemed necessary, shown weight in grams, sold with shown non original box. These are a pair of vintage (1970s) fully hallmarked, bright cut sterling silver cufflinks. They weigh 9 grammes and have wear commensurate with age. Heavy Vintage Alfred Dunhill Solid Sterling Silver Cufflinks Boxed. Condition is Used. Dispatched with Royal Mail 2nd Class. Emporio Armani EGS1885040 Stainless Steel Cufflinks. Condition is New with tags. Dispatched with eBay delivery – Shutl 2-3 days. Sterling silver and fibre circle cufflinks by LB&BCo Birmingham, with hinged bar back links, stamped 925 for Sterling silver with Birmingham assay mark. Shape\pattern: Round. Main Color: Black. At TrendySavers, this is pretty simple and straightforward. Material: Stainless Steel. Gucci Sterling Silver 925 Nautical Square Knot Cufflinks (1976). Condition is Used. Dispatched with Royal Mail 2nd Class. Lovely pair in good condition ( see pictures for details). It`s stamped BMCo SILVER. gucci cufflinks. Will benefit from a professional clean. Have scratches but no damage. Stamped. Genuine. No box or bag. A nice pair of silver cuff links. 2 cm long on the face in good condition. Maker:- Shetland Silvercraft. Fully hallmarked for Edinburgh 1964 along with the maker's mark "SS" for Shetland Silvercraft. "YACHT" Cufflinks. Edinburgh 1964. Sterling Silver. (ESPECIALLY IF ALL THE OTHER WATCHERS FORGET) ! Sterling Silver 925 Cufflinks. Condition is Used. Approx weight 9g (though please note this is an approximation as my scales don't do points so it will be give or take a tad.) Hallmarked and tested with Caratest to confirm they are silver. Please use the images as your guide to this item's condition. 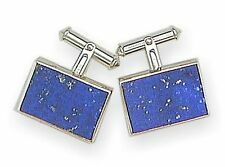 Each cufflink face measures approx 1.5cm x 2.2cm. £1 coin for size reference is not included. I'm happy to combine postage and have many other beautiful items for sale so feel free to take a browse. To combine postage simply message me before paying. Condition is Used. Unused gift does not go with my tee shirts. Will make an excellent gift. They are made of 925 sterling silver and stamped 925 silver mark. 18 mm by 11 mm. Vintage Mens Wedgewood Cuffliks, Stamped Silver, Chariot Rider & Horse pattern. I’ve listed condition as Used however these have never been used by my father so remain as new. Please take a look at the pictures these are beautiful. Please take a look at my other items listed on Ebay as having a huge clear out. Please note I only post by SIGNED FOR mail as per Ebay policy. Due to the shape of these I will be post by Small Parcel. Mother Of Pearl. 925 parts per 1000. Sterling Silver. We follow catwalk styles to make sure we can bring you the latest fashions. One of TJC’s founding principles is to do the right thing and our One for One charity ensures we do just that! Vintage sterling silver Cufflinks marked 925s with a lion and date stamp 'u' in very good condition .... zoom in on pics. Will post first class signed for to UK only. Condition is used, but excellent with. ALLIGATORS CUFFLINKS, STERLING SILVER by G.DANILOFF & CO.
BEE CUFFLINKS, ENAMEL, GOLD, STERLING - G.DANILOFF&CO. FOX CUFFLINKS, STERLING SILVER, ENAMEL - G.DANILOFF & CO.
PIRATE SKULL CUFFLINKS, CURVED BLACK HORN, 24K GOLD, STERLING. G.DANILOFF&CO. HOWLING & GROWLING WOLVES CUFFLINKS, STERLING SILVER, TOPAZ. G.DANILOFF&CO. DINOSAURS T-REX STERLING CUFFLINKS, SAPPHIRE EYES, ENAMEL. G.DANILOFF & CO.
PIRATE SKULLS CUFFLINKS, SILVER, HORN, ENAMEL,TOPAZ. G.DANILOFF&CO. Men's sterling silver cufflinks are stylish, functional and ornamental accessories that are suitable for formal and informal dressing. Classic men's cufflinks traditionally have an elegant and timeless design. 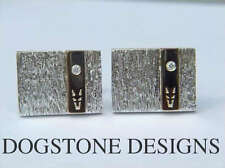 Many vintage men's sterling silver cufflinks are investment pieces and future heirlooms. Most cufflink styles have an oval or square shape with plain, engraved or minimalist detail. 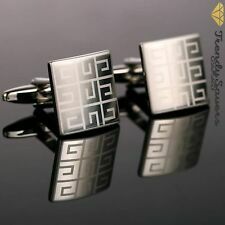 Chic designer men's sterling silver cufflinks are available in a wide selection of styles, shapes and decorative finishes. Some cufflinks feature elegant diamond embellishments. Many vintage men's sterling silver cufflinks are decorated with elaborate engravings, in classic chain link style. 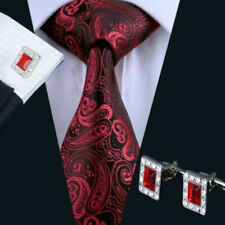 Novelty men's sterling silver cufflinks are available in a wide range of shapes, designs and styles. Sports cufflinks , automobile and aviation themes are popular choices. 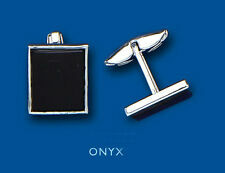 Black Onyx is a popular embellishment choice for traditional and classic formal cufflinks. Coloured Onyx variations are also available. Glossy mother-of-pearl is the standard cufflink choice for formal white tie occasions. 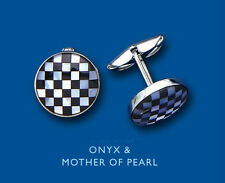 These elegant decorative mother-of-pearl cufflinks are available in a variety of styles. Amber is a popular choice for enhancing designer men's sterling silver cufflinks. The golden coloured semi precious gemstone is often complemented with jet. Sparkling diamonds create a high-end fashion statement and sophisticated men's sterling silver cufflinks. Enamel is a popular material that is fused from powdered glass. 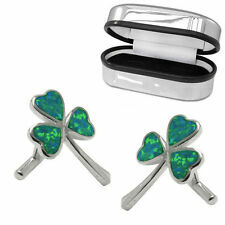 Men's sterling silver cufflinks that are decorated with enamelling typically feature a bold colour and striking design. Most styles have vintage and retro design appeal. Plain and simple men's sterling silver cufflinks that feature no stone or embellishment are available in a wide range of designs. 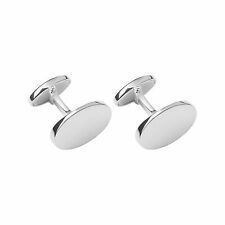 Stud men's sterling silver cufflinks have a large head, a straight post and a smaller interior back. The smaller head is tilted and threaded through the cuff button hole. To lock into place, the head is straightened. The most common and popular type of men's sterling silver cufflinks is the whale head. The flatheaded cufflink has a straight post and a whale tail shape back. The 'tail' is inserted into the cuff hole and flipped to secure in place. Chain link men's sterling silver cufflinks have identical ends with a chain link between them. 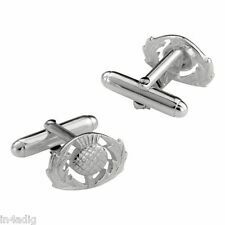 Ball return men's sterling silver cufflinks have a curved post with a heavy ball on the decorative end. The most innovative men's sterling silver cufflinks feature a dual-action hinge mechanism locking system.